So what exactly is Soya? Well it's definitely not tofu! 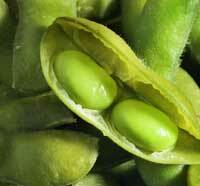 Soybean oil is made from the seed of the soy plant. It's also known as edamame when eaten in its natural form; that tasty appetizer we eat at our local sushi joint. Soybeans were grown for centuries in Asia just for their seeds, whereas now soybean oil can be sound in many forms. One of them being in skincare! - repels mosquitos : a natural alternative! All SoyaSkin products are made using all-natural soybean oil.